More than 220 people attended the 15th annual Redland City Mayoral Prayer Breakfast this morning, raising another $15,000 to support school chaplaincy programs in the Redlands. Redland City Mayor Karen Williams said the popular annual event, which brought the community together in a spirit of generosity and prayer, had now raised more than $115,000 since its inception. “The Mayoral Prayer Breakfast has become a very special event for our community since it began in 2003, helping to make a real difference for local youngsters through the work of our school chaplains,” Cr Williams said. “The chaplaincy programs provide a wonderful source of guidance and support for Redlands students to fulfil their potential, as well as opening the door to spirituality. They really do change lives, particularly for students experiencing grief and loss or those who need a hand overcoming life’s difficulties. This year’s guest speaker was Pastor Neale Collier, a chaplain at Cleveland District State High School and pastor of Mt Cotton Community Fellowship, who spoke about the value of giving our young people opportunities to develop and show compassion. “I believe becoming an outward-facing, compassionate person is the key to overcoming adversity and gaining a sense of fulfilment in life,” he told the gathering of business leaders, government representatives, community members, local church and school leaders and students. Pastor Collier told the stories of three local children whose lives have been transformed by their involvement in the Library Project, through which much needed books and resources are collected and shipped to schools in Vanuatu. Cr Williams also praised the backing of local businesses and organisations, many of which continued to support the event year after year. 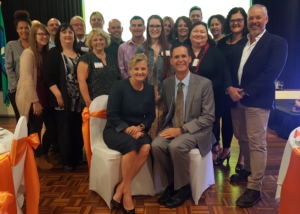 Redland City Mayor Karen Williams with guest speaker Pastor Neale Collier (seated) surrounded by school chaplains serving at state schools throughout the Redlands.